I am very grateful to Holly Marie Colino for writing this Guest Post about the Meaning of the Ace of Cups Tarot Card. All Aces relate to change from inside out and to changes from the outside, that influence our internal self. The main focus of this Ace, is Cups, which symbolizes the Heart and matters of Love. Matters of Love relate to all types of Love and not just Romance. Acts of compassion, nurturing, tenderness, care, trusting, intuition and soft expression, are a few examples that relate to many types of people, places and situations. 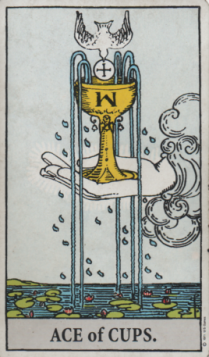 The influence of the Ace of Cups, in relation to the Heart being a focus, is that a transition in your choices, may be a reflection of allowing your Heart to lead, rather than your logic, independently. All Aces are a renewal and increase within the focus the Ace carries. In this case Love is the element of renewal and increase. If a renewal and increase of strength as an influence, is relative to you regarding Love and the Heart, you may then be experiencing a renewal of Trust within your Intuition and Feelings. In order to be surrounded with Love, it must be in your visual and emotional Perception to draw inward and then outward. To radiate Love outward, we must vibrate the seed of Love within. I very much hope that you have enjoyed this Post about The Ace of Cups Meaning, by Holly Marie Colino. If you would like to receive ongoing encouragement in developing your own intuitive powers. Click here to subscribe to our bi-monthly intuition development Newsletter ‘INTUITIVE’. Subscribers will automatically entered into a draw for a free Intuitive Email Tarot Reading. Click here to order an Email Tarot Reading from Psychic Medium Selena.